We were saddened to learn that Who Framed Roger Rabbit? star Bob Hoskins passed away last night, and this video shows just how game an actor Hoskins was—turning himself into a human cartoon as he acted against a blue screen. 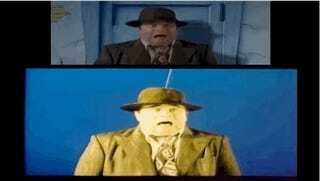 This before and after VFX reel really shows off Hoskins—as private investigator Eddie Valiant—miming and reminds us that, while the rest of us got to see his scenes composited with animation, he had to bring a lot of his own imagination and physical comedy to the film. You will be missed greatly, Mr. Hoskins.